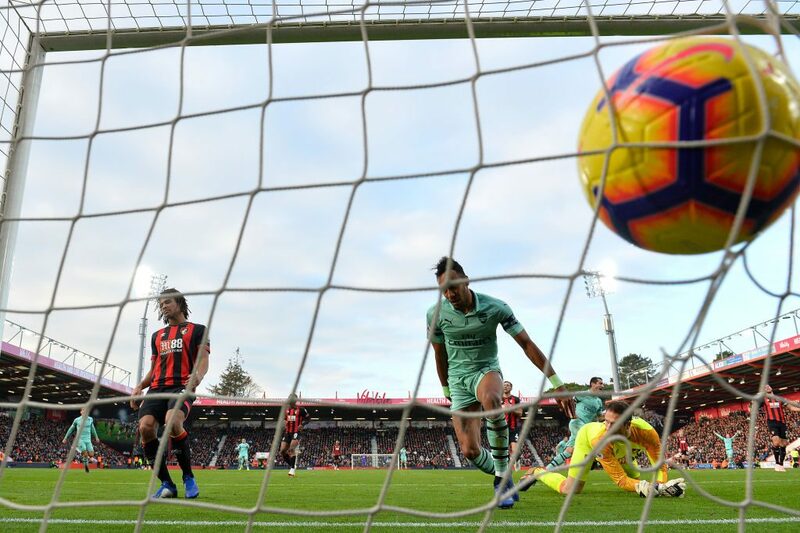 Pierre-Emerick Aubameyang extended Arsenal’s unbeaten run to 17 matches with the goal that sealed a 2-1 win at Bournemouth on Sunday. Unai Emery’s side took the lead through Jefferson Lerma’s bizarre own goal before Josh King equalised on the stroke of half-time at Dean Court. Aubameyang netted his eighth league goal of the season midway through the second half to lift the fifth placed Gunners within a point of the top four in the battle to qualify for next season’s Champions League. Emery left German playmaker Mesut Ozil on the bench and was without French striker Alexandre Lacazette due to a groin injury. But Arsenal were still strong enough to consign Bournemouth to a third successive defeat as Emery’s decision to switch to a back three for the first time paid dividends. Bournemouth thought they were ahead early on, but David Brooks was flagged offside as he slotted home King’s through ball. Arsenal went up the other end and Lucas Torreira rattled the foot of the post with a fierce shot, with Alex Iwobi only able to lash the rebound high and wide. When Aubameyang spurned a good chance after Henrikh Mkhitaryan had rolled in his team-mate, Arsenal fans began to call for the introduction of Ozil. But the supporters who made the trip to the south coast were celebrating the lead in the 67th minute.